On September 8, The Miami Climate Alliance is hosting the Miami Rising for Climate Jobs and Justice Concert. 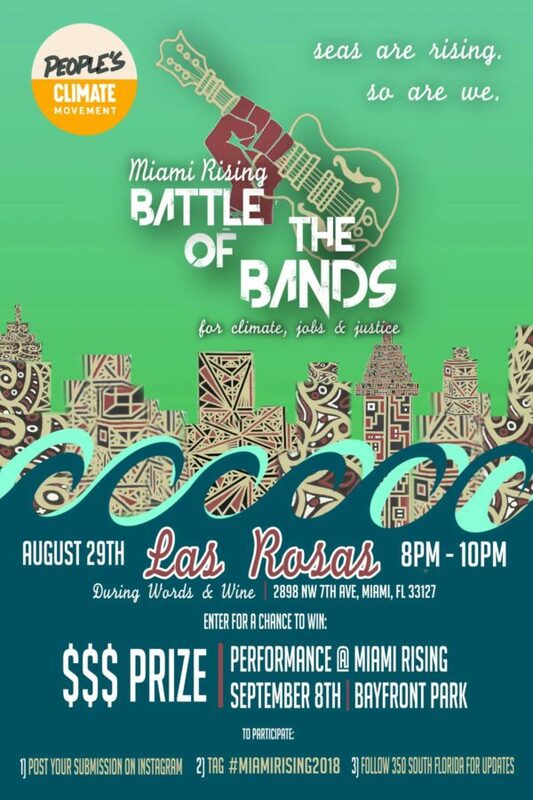 As a prelude to that, 350 South Florida is hosting a BATTLE OF THE BANDS on Wednesday, August 29th at Los Rosas during Words and Wine. Cash prizes will be awarded! Join the incredible musicians of South Florida as we tell the story of climate, jobs, and justice for our communities; because to change everything, it takes everyone. Come and compete with the talented musicians of Miami. Deadline for your band to apply is August 17, 2018. Application does not guarantee inclusion. Spaces are limited. 2. Opportunity to perform during Miami Rising 2018 event. To apply to compete, fill out the form below. Follow 350 South Florida on Instagram for updates. By mobilizing through music we are finding alignment with partners under the banner of climate, jobs, and justice; and lifting up our core priorities of economic and racial justice, we are building the power required to win real and lasting climate policy on the federal, state, and local level. *All types of musical expression accepted. Submission pages will be contacted by the 350 Team on next steps on how to engage your fanbase and Miami at large in your art. How do you think music can illustrate the climate issues facing Miami and the World? Submit 3 promo images of your performances. If possible, include 1 outdoor photo.